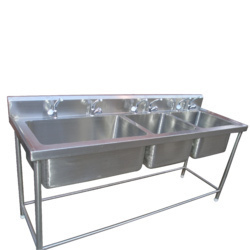 Our company has gained name and fame in offering Three Sink Unit to the clients. Three Sink Unit is precisely manufactured with the use of premium quality material and high-tech machines under the guidance of adroit professionals in set quality norms of the industry. This product is carefully tested against diverse parameters of quality. Offered range is known by the esteemed clients for attributes like light weight and excellent finish. Sheela Equipments Pvt. Ltd. is Established in year 2009 in order to manufacturer, exporter & Supplier of kitchen equipments. These equipments are used mostly for Commercial Kitchen and Catering Equipments produces hi-tech and state-of-art Kitchen Equipments especially crafted to cater the needs of Hotels, Restaurants, Banquets, Industrial/Institutional Canteens,Hospitals, and Bakeries.These include Pre Preparation Area, Store Area Equipments,Refrigerator and Freezer, Dish Wash Area,Cart and Trolley etc. Our company believe and work with an aim to prioritize & fulfill objective of our Customer first, thus we have evolved as a total Kitchen Equipment with accumulating a wealth of experience and expertise. The company also provides proposed layout of the whole project for its customers. Our major thrust is to provide integrated solutions that meet the needs of every Hospitality establishment whether it’s new project or existing unit.